Duke is going to play in the National Championship tonight. But that isn’t going to be my strongest memory of Saturday. At approximately 3:09 PM, California time, Duke tipped off in their Final Four tilt against Michigan State and, being the true fan that I am, was smack dab in the middle of my 11-7 shift at the casino. It’s probably worth mentioning that I called off work last Sunday because I was “sick,” and it just so happened that the Devils were playing Gonzaga at 2:00. Imagine that. I exhausted a day off for the Elite Eight, not the Final Four. Luckily, I was on break for the tipoff. I shot over to the employee dining room and snatched a quick cup of coffee before heading out to the smoke area. There, I went on the March Madness Live app on my iPhone and watched the first eight minutes of game action, or at least until the under-12:00 timeout. After the Spartans jumped out to a 14-6 lead, Duke whittled it down to 14-11 when I returned to the floor to start dealing again. 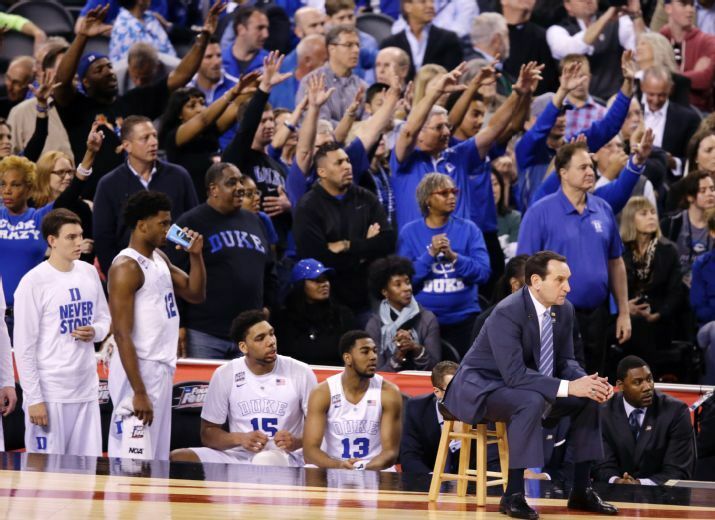 What I will remember today for, though, wasn’t Duke; it was Kentucky. More specifically, Kentucky losing. It’s hard to appreciate right now, especially since my favorite team will play the team that just beat the Wildcats, but Kentucky had one of the greatest seasons of all-time in 2014-’15, and it bums me out that Duke won’t get a chance to be the team that beats them. On the ride home from work, like I did a couple weeks ago when Duke played Utah, I listened to the Kentucky-Wisconsin game through my speakers. The Badgers were winning consistently throughout the second half, then with a few minutes to go Kentucky was up four. After that, almost nothing went right for the Wildcats. Wisconsin hit some big free throws down the stretch and one of the best teams in the history of the sport simply couldn’t find the bottom of the net. In March, that’s how quickly things go. At this stage of the tournament every game is a veritable coin flip anyway — even Duke’s 20-point stomping of MSU — and Wisconsin’s win really wasn’t that crazy. Based on Kentucky’s unblemished record, it was an upset, sure, but to call it unexpected takes away from just how good the Badgers are this season, so I won’t. At the very least, I will always remember where I was and what I was doing when Kentucky’s perfect season was lost. Now Wisconsin takes on Duke, a matchup of the 3rd and 4th overall No. 1 seeds, and a rematch from December 3rd when the Blue Devils won 80-70 at the Cole Center. Bovada currently has Wisconsin at -1, making Duke the slightest of underdogs. FiveThirtyEight calls the game a coin flip, and has Wisconsin as a one-point favorite. Both teams play superior offense, with a slight edge to the Devils on the defensive end. They have been especially nasty during the NCAA Tournament, holding its three opponents to 56, 49, 57, 52 and 61 points, respectively, an average of 55.0 points per game. It’s a true tossup, but I love this Duke team too much to pick against them. I like the Devils by eight points. Let’s say… 76-68.